We returned to the church with the van, where the youth pastor and the health and wellness counselor let us take shelter from the sun. The interviewer from the news had given us a ride to the van, after we had talked and gotten some footage of us walking the world by the road. There was a work truck on the lot, when we returned, and men preparing the parking area for blacktopping. One man had a gas-powered blower on wheels and was working piles of pebbles to the edges. Another used a two-wheeled-dolly and a sledge hammer to coax the concrete bumper blocks off into the grass. I was pretty sure if we stayed there, we would be in the way. Soon I would be surrounded by quick drying tar. I pulled the plug on the world and waited for it to slowly sag into an awkward pile of canvas. Nice (the dog) and I were under the shade of the carport by the office door when a Postal delivery truck pulled in. I haven't mentioned lately about Nice (the dog) and his search for a certain postal worker we met two years ago. When we walked the Eastern coast of Florida we had met her on her daily delivery route in Jupiter Beach. Graciously she helped that night to leap-frog the van and world out of Jupiter. Jupiter Beach authorities were very strict about parking so we had to drive across town . Because I had to follow her to park for the night at her apartment complex, Nice rode with her in her pickup truck for a long while. With the logistics involved in getting the support van out of Jupiter the next morning he, again, rode with her while we conveyed the the van twelve miles ahead. Since that day Nice has been a dog possessed. 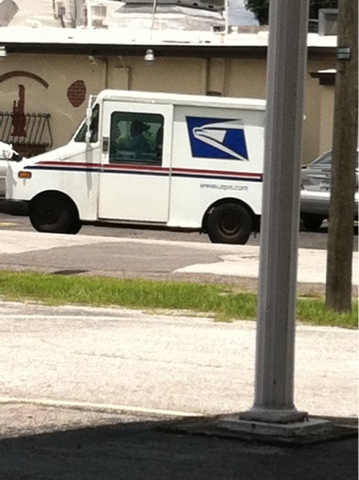 Postal trucks or women with blonde hair driving a white Chevrolet pickup truck. Anywhere we have been, whether it was the coast of Oregon or the plains of Nebraska, Nice has been searching for her. When the door of the postal truck at the church opened and a woman emerged with blonde hair Nice was again excited, then obviously let-down when she got back in the truck and drove away. This happens all the time. So often that, I cannot deny the connection. While waiting for the world to deflate I checked on Facebook and found that the object of Nice's affections will be on vacation until the end of the week. After all that Nice has gone through, I have been in contact with her to arrange Nice's moment in the sun, to see her again. Their reunion would have to wait a little longer. I loaded the World in the van and drove us back to Spring Hill where we have waited out the Spring season healing, to the loving arms of Nice's adopted mothers. Only an hour away by car we could have a cooler place to sleep. Four days of constant sweating, we had walked ten miles into Tampa. Technically we had reached our goal, but we had to wait a little longer to go to Jupiter and fulfill Nice's desire.